Volumetric response to therapy has been suggested as a biomarker for patient-centered outcomes. The primary aim of this pilot study was to investigate whether the volumetric response to induction chemoradiotherapy was associated with pathological complete response (pCR) or survival in patients with superior sulcus tumors managed with trimodality therapy. The secondary aim was to evaluate a semiautomated method for serial volume assessment. In this retrospective study, treatment outcomes were obtained from a departmental database. The tumor was delineated on the computed tomography (CT) scan used for radiotherapy planning, which was typically performed during the first cycle of chemotherapy. These contours were transferred to the post-chemoradiotherapy diagnostic CT scan using deformable image registration (DIR) with/without manual editing. CT scans from 30 eligible patients were analyzed. Median follow-up was 51 months. Neither absolute nor relative reduction in tumor volume following chemoradiotherapy correlated with pCR or 2-year survival. The tumor volumes determined by DIR alone and DIR + manual editing correlated to a high degree (R2 = 0.99, P < 0.01). Volumetric response to induction chemoradiotherapy was not correlated with pCR or survival in patients with superior sulcus tumors managed with trimodality therapy. DIR-based contour propagation merits further evaluation as a tool for serial volumetric assessment. Die empfohlene Behandlung von apikalen Sulkustumoren ist die Radiochemotherapie, gefolgt von Chirurgie. Patienten mit einer histopathologisch vollständigen Remission in dem resezierten Präparat haben eine bessere Prognose. 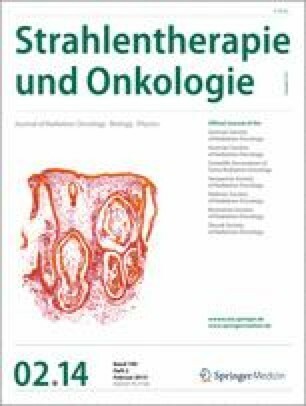 Diese retrospektive Studie untersucht zum einen, ob die Volumenabnahme auf die Induktion der Radiochemotherapie eine vollständige histopathologische Remission („pathological complete response“, pCR) oder das 2-Jahres-Gesamtüberleben vorhersagen kann, und zum anderen die Effektivität der halbautomatischen, auf „deformable image registration“ (DIR) basierenden Segmentierung für die sequentielle Volumenmessung. In dieser retrospektiven Studie wurden die Behandlungsergebnisse einer Datenbank der Abteilung entnommen. Das Tumorvolumen wurde abgegrenzt auf der Computertomographie-(CT)-gestützten Bestrahlungsplanung, die typischerweise während des ersten Zyklus der Chemotherapie durchgeführt wird. Die Tumorkonturen wurden auf die Post-Induktions-CT mittels DIR mit und ohne manuelle Nachbearbeitung übertragen. Es wurden CT-Aufnahmen von 30 geeigneten Patienten analysiert. Das mediane Follow-up betrug 51 Monate. Weder die absolute, noch die relative Tumorvolumenreduktion korrelierten mit der pCR oder der 2-Jahres-Überlebensrate. Post-Induktions-Tumorvolumen von DIR allein und DIR mit manueller Nachbearbeitung korrelierten stark (R2 = 0,99; p < 0,01). Die Volumenabnahme infolge einer Induktions-Radiochemotherapie konnte weder die pCR noch das Überleben bei Patienten mit apikalen Sulkustumoren, die mit trimodaler Therapie behandelt wurden, vorhersagen. Die DIR-Segmentierung als ein Instrument zur Messung der longitudinalen Volumenänderung bedarf der weiteren Erprobung. Dr. E.S.M. de Lange-Klerk’s support with the statistical analysis is greatly appreciated. Furthermore, we thank Dr. Lothar Schwarte for his help with the German translation of the abstract. Conflict of interest. C.G. Vos, J.R. van Sörnsen de Koste, S. Senan, I. Bahce, M.A. Paul, E. Thunnissen, E.F. Smit and K.J. Hartemink have made no statement. M. Dahele received travel expenses +/− honoraria from Varian Medical Systems Inc. and Brainlab AG. The Department of Radiation Oncology, VU University Medical Center has research collaborations with Varian Medical Systems Inc., USA and Velocity Medical Solutions, USA. All studies on humans described in the present manuscript were carried out with the approval of the responsible ethics committee and in accordance with national law and the Helsinki Declaration of 1975 (in its current, revised form). Informed consent was obtained from all patients included in studies.